Any family or person dealing with loved ones who struggle with disabilities encounter a changed life once the disability is recognized. The family attention and energy shifts. We sometimes give less attention to others and/or ourselves. Support organizations and various support groups are a necessity. It’s wonderful that they have populated. Every six months, I will feature a non-profit organization that focus’ assistance to those with ASD or other disabilities. Information will be posted outlining this organization’s purpose. Also posted will be contact information and ways in which assistance and support can be gifted, whether it be volunteering or donating beyond our pledged commitment. Currently we pledge $1.00 for every item sold to the organization being featured. I know, it doesn’t sound like much but as we are getting off the ground floor, we commit to increasing our donations per item. This is our commitment from Crave Crustaceans. Our daughter is the light of our life, very intelligent, lives independently, works as a pet sitter, is incredibly artistic, a true lover of all animals, and sports a wonderful personality with great communication skills! Yes, she continues to struggle with certain issues. The positive report is that, as time passes, she finds ways to cope and master many of those issues. Thank you for becoming a part of this endeavor that began as a dream! Karen Shirk established 4 Paws for Ability, Inc., in 1998 in Ohio. The 501(c)(3) non-profit organization was created to fill a gap in providing highly-trained service dogs to children and veterans. 4 Paws service dogs are provided to children regardless of age, disability, or geographic location. 4 Paws for Ability additionally places service dogs with veterans of recent conflicts with no fundraising requirement. Since its inception in 1998, 4 Paws has placed over 1,250 dogs across the United States and in countries including Australia, Canada, Germany, Japan, New Zealand, and Switzerland. 4 Paws was the first agency in the United States to begin placing task trained Autism Assistance Dogs and the first agency known to place these assistance dogs with tracking skills. At 4 Paws we have discovered a magic that exists between children and dogs, a magic that can become a life-saving miracle for a child paired with one of our Autism Assistance Dogs. An Autism Assistance Dog can be trained in a variety of tasks to assist a child. These include behavior disruption to distract and disrupt repetitive behavior. If the child is crying the dog can be trained to recognize that sound and come up and snuggle with the child or give kisses to provide comfort. Often the service dog intervening will either reduce the length of the meltdown or even prevent it from occurring. These skills are task trained and meet the definition of a service dog which allows public access. This differs from an Emotional Support Animal whose simple presence provides comfort and does not have general public access. For more information about 4 Paws for Ability, please visit their website. The Autism Assistance dog has the public access rights to provide a source of comfort and consistency when environments change and anxiety might be high. Many families are able to go more places because they have the service dog. The dog is not only able to provide the task trained skills in public, but also their presence helps to deescalate a situation. Many parents report that their child sleeps better at night because the service dog is sleeping with them and providing that constant comfort. Parents may also choose to use some of the service dog’s task trained skills to provide comfort to help the child to fall asleep. If the child wakes up at night, they are able to snuggle with their best friend and buddy and fall back asleep. Typical children may not understand or know how to relate to a child who is displaying meltdowns and repetitive behaviors. When the child with autism has a service dog, suddenly they are the most popular person on the playground or in public and everyone wants to interact with them. 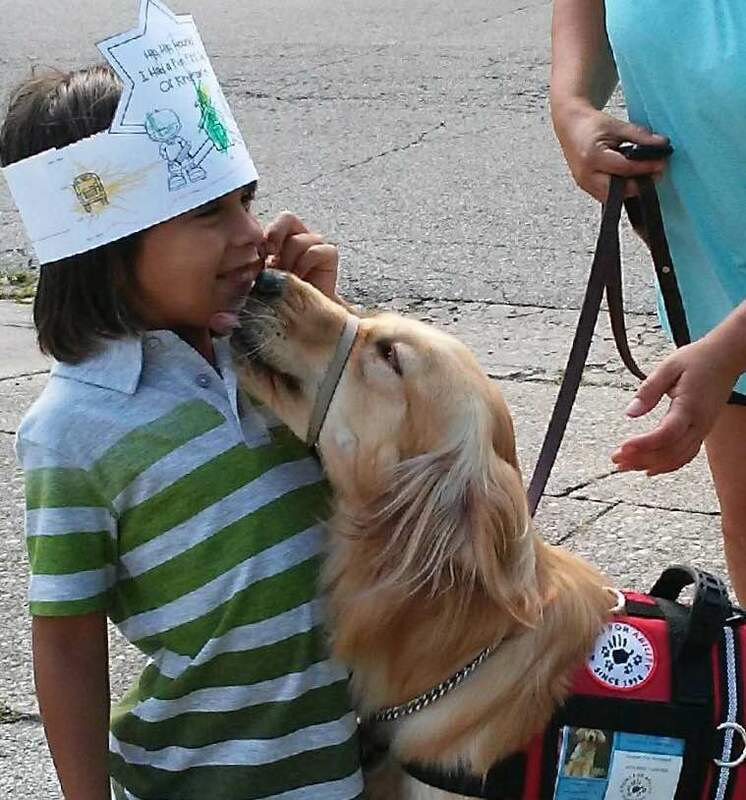 Many children enjoy learning how to brush, feed, and take care of their service dog. This gives them the opportunity to be responsible for something and they can take pride in their efforts as they learn important life skills. For children who struggle with verbal skills, asking the dog to perform a trick or other command can be an incentive to communicate. In public, the child has the opportunity to talk about their service dog with other people. While the needs of each child are unique, all of the families contacting 4 Paws have one very important common need; their child has few, if any, friends. Having a service dog that is bonded closely to their child is an opportunity for the child to have a best friend who loves and accepts them unconditionally.